AN Midwest Editor Matthew Messner spoke with Daniel Safarik, editor for the Council on Tall Buildings and Urban Habitat (CT­BUH), about its “Tall Timber: A Global Audit.” The audit documented proposed, under-construction, and built tall buildings that use mass timber as their primary structural materials. The Architect’s Newspaper: What Prompted the CTBUH to conduct an audit of timber projects around the world? Daniel Safarik: We track all kinds of tall build­ing construction routinely for the Skyscrap­er Center database and for our Global News feed on our website. The first well-publicized tall timber building was Stadthaus in London, which was completed in 2009. We noticed what seemed like a spike in announcements of timber tall buildings being proposed and constructed about four years ago , and everything that has happened since has re­affirmed this impression. When we saw the buy-in from the U.S. government represent­ed by the U.S. 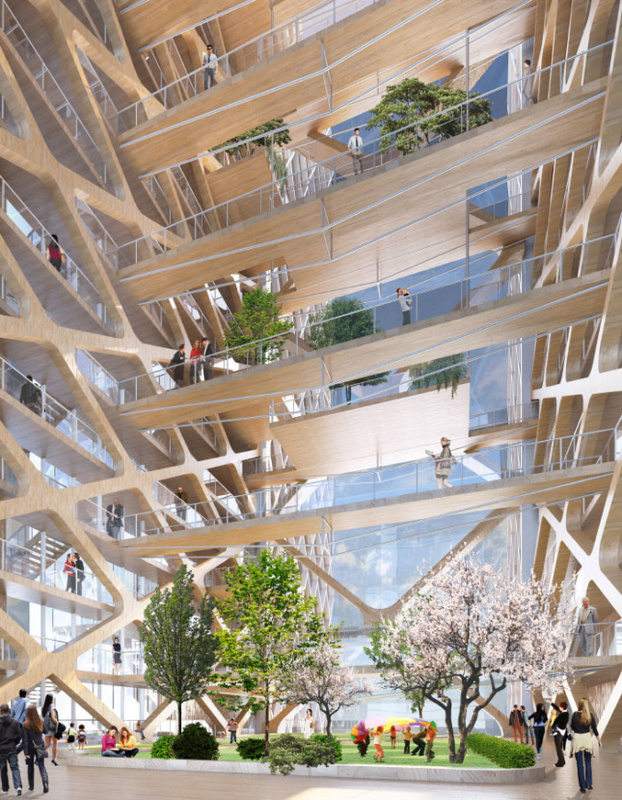 Tall Wood Building Competition, in October 2014, that confirmed the impression that this really had momentum behind it, so we committed to tracking the two resultant projects through to comple­tion. Unfortunately, the New York project was canceled due to market feasibility concerns, but the Portland project is now under con­struction. So the momentum began to build from that point, and we formed a Tall Timber working group in late 2014. The group started working on a design manual in mid-2015, and that effort has now gotten a turbo boost with the audit and the upcoming workshop at our 2017 conference, which is bringing together a lot of the key participants. Were there any interesting surprises once the information was gathered? The most striking thing was the diversity of construction methods that are being used to create these buildings, which are specific to local jurisdiction and the nature of the tim­ber supply in each region. Of course, herein lies the difficulty of generalizing about what’s going on in tall timber worldwide, as well as coming to a consensus about classification and best practices—that is our challenge. What are some of the interesting discus­sions happening around mass timber? It’s encouraging to see the range of propos­als, from both a stylistic and construction standpoint. The primary discussions revolve around fire safety and code, sustainability, and the feasibility of modifying fabrication techniques from mass production of stick-built single-family and platform-framed low-rise buildings to something that is workable for high-rise. What do you think the next steps are, or barriers to overcome, for mass timber to become a common building method? The foremost obstacle is local fire codes. Most fire codes prohibit wood structures from rising above five or six stories. Many codes stipulate that a building of this height must also have a concrete base, particularly if there are commercial uses on the ground floor, such as restaurants, or if there is vehi­cle parking, to give one to three hours of fire protection that would allow safe exiting before structural collapse. This is predicated on the assumption that wood high-rises would use platform construction, with dimension­al lumber such as two by fours, beams, and joists, similar to those currently permitted. The key to mass timber’s viability as a struc­tural material for tall buildings lies in its name. Massive wood walls and structural beams and columns comprised of engineered pan­els have demonstrated fire performance equal to concrete and, in some cases, su­perior to steel. Wood unquestionably burns, so there would be smoke issues, as with any fire, which would require proper sprinklering, pressurization, and other tactics used in tall buildings today. But mass timber has to burn through many layers before it is structurally compromised—basically it “chars” long be­fore it collapses. As more jurisdictions come to appreciate the aesthetic, economic, and environmental advantages of tall timber, fire codes are expected to change. The second-biggest obstacle is a lack of standardization of construction materials, methods, and definitions. There are many forms of mass timber, and a wide degree of variance in approach when it comes to sup­porting tall timber structures. Thus, there is a range of techniques, from assemblages of highly similar panels for both floors and walls, to complex column/beam/outrigger combi­nations, such as are found in high-rises of steel and concrete. There are numerous pro­prietary systems, and the connections be­tween elements also vary widely—often it is the location and orientation of the steel con­nectors between wood elements that can make all the difference in how long a struc­ture can withstand fire or seismic action, and thus determine its feasibility under local code. Are there any proposals, speculative or real, that you are particularly excited about? 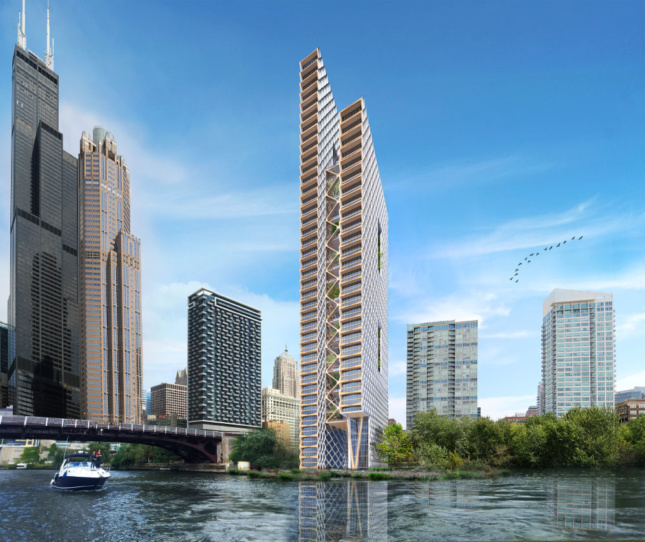 I like the one we published in the CTBUH Journal for Chicago: the River Beech Tow­er. It would be great to see that go up in our home city.